Bandera County is not only the place where “the misfits fit,” it is also the place that draws uniquely talented individuals who fit into the category of “national treasures.” Enter into that category BR Lightning Ranch owner Bill Rivers who doesn’t have a tiger by the tail, but once had his neck in a lion’s mouth. Too modest to call himself a national treasure, movie animal trainer Rivers has pictures that would seem to prove otherwise, including ones of himself with the late President Ronald Reagan, Bill Cosby, James Whitmore, Candice Bergen, Jett Williams (sister of Hank Williams Jr.) - and his favorite photos - his many trained animal stars. Most recently, Rivers has had his animals in a 2004 movie “Hidalgo,” with Omar Sharif, a 2005 movie, “Racing Stripes,” in which the zebra Rivers trained ran in the Kentucky Open against horses and the 2007 release, “Evan Almighty,” which used just about all the animals of every species that Rivers had trained or could train. His newest venture, training ostriches to race and training jockeys to ride them for a Disney movie that will be released in 2010, “Prince of Persia,” took him to Morocco. The story of Bandera’s newest national treasure started long before two years ago when the California resident of 36 years drove into Bandera and decided to stay. It began with his childhood. His father Jonny Rivers ran a Wild West show, “Jonny Rivers Golden Horse Troop” and also toured fairs and other venues in the 1950s with diving mules - that still highlight the BR Lightning Ranch Rodeos. Brother Tim Rivers provides animals for movies and commercials and frequently visits BR Lightning Ranch. Rivers began his own animal-oriented career as a bull-fighting rodeo clown. When the owner of the Movieland Wild Animal Show became his father-in-law, Rivers’ animal training career began. Ever wonder where the kangaroo that Granny “fist fought” with on the “Beverly Hillbillies” came from? Or the ostrich that Candice Bergen met on the “Murphy Brown” show? Well, now you know. Rivers almost never made it out of California alive, however. He was training a lion for the 1980s “Tarzan” movie when the lion grabbed him around the neck. “I came close to dying,” he remembered. “Cats and bears and monkeys do not make good pets.” - even though as a premiere animal trainer, Rivers had a chimp for years that put on acts. Until it caught a disease from wandering sheep, Rivers had a trick buffalo that he rode. “Anyone could ride him. I could put that buffalo in an elevator or anywhere. I led it around by the hair on its chin. “Working with animals is always challenging. They usually want you to do something ridiculous or impossible. I tell them ‘No,’ and they start making suggestions on how it might work. Then, I still tell them ‘no’,” Rivers said, explaining how he insists on safety and minimum stress for his animals. Rivers continued, “Camels are a bit tricky to train. You break them to ride much like a horse. I had a lot of background shots in Hidalgo with Omar Sharif. It was a true story about a cowboy from America who went to the Sahara Desert with his mustang and entered a big race over there. “The hardest thing I ever did was to get a rhino to stand beside a Dodge Durango for a commercial. There was one minor problem. The rhino tore up the set. But no one got hurt. Rivers welcomes people to visit the BR Lightning Ranch, at 818 FM 1283 in Pipe Creek, and see the animals. Call 830-535-4096 for more information. Aside from the animals, BR Lightning Ranch is also an operating bed and breakfast guest ranch with cabins available for extended stays. Horseback riding is also available. The rodeo is a summer series every Saturday night at 8 pm in the summer months. The winter bull riding series will start in mid-November and go through March. Rivers plans to host a play day horseshow in the near future. BR Lightning Ranch is open year-round. As for Rivers, he may or may not be at the ranch. When he gets a call for one of his animals, he takes to the road. He has a commercial shoot planned for San Antonio or Dallas featuring one of his buffalo. It beats driving a truck. His Business Is "Everything Camel"
Second generation exotic animal trainer Bill Rivers has made a business out of finding niche opportunities for camels and other exotic animals. That includes work in movies, parades and festivals, as well as summertime leases to businesses offering camel rides. "Camel ride leases are priced according to the volume of people coming through," explains Rivers. "We're in the business to rent or lease animals. We'll go anywhere if the price is right and lease to anyone with a legitimate business." Rivers has supplied camels and even a zebra for movies in Africa, as well as movies in this country. He offers camel safaris on his guest ranch in Texas and leases camels to zoos, amusement parks and to individuals for camel rides. Recently he held his first camel training symposium. Rivers' camels have appeared in the "Scorpion King", "Hidalgo" and "Evan Almighty" movies. In the latter case, his camels were accompanied by lots of other exotic animals trained by Rivers. As a camel breeder and trainer, Rivers advises people interested in buying a camel to start with a well-trained adult. "With babies, you don't know the background or health," he explains. "You may end up with something that you can't handle or isn't suited for what you want to do." Rivers is also interested in training trainers. 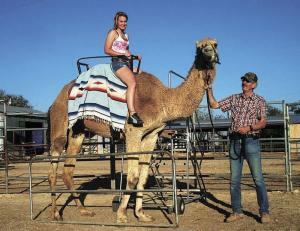 A recent camel training clinic attracted about a dozen people. Rivers says he will be holding a second seminar in late October of this year. The seminars, like his safaris, grew out of an interest expressed by customers. Contact: FARM SHOW Followup, BR Lightning Ranch, 818 FM 1283, Pipe Creek, Texas 78063 (ph 830 535-4096; billrivers@indian-creek.net; www.lightningranch.com or www.movielandanimals.net). 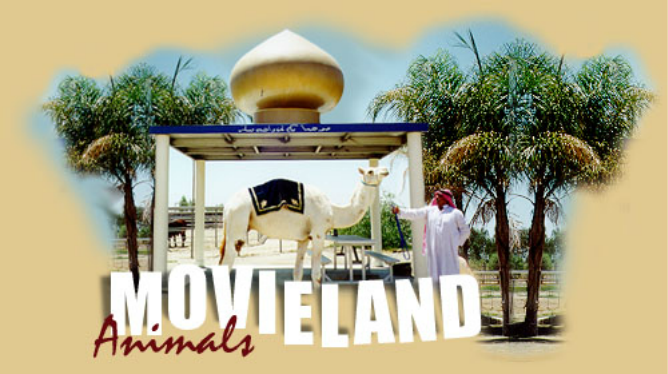 For over 41 years, BR Lightning Ranch and Movieland Animals owner Bill Rivers has trained animals for shows and movies. His latest - the Disney film “The Prince of Persia” - is showing now. Rivers demonstrates his expertise in the ostrich-racing scene, where not only “managed” the ostriches, he also appeared in the film and trained the other ostrich jockeys. He spent a total of about five weeks training and filming in Morocco, utilizing 20 ostriches on the set in the desert about 45 miles outside of Marrakesh. Rivers was born into the animal training business. His father, Jonny Rivers, operated a Wild West show called the “Golden Horse Troupe” back in the 1950s and ‘60s. Bill Rivers started his first job when he was just five years old, riding and working with a trained pony that could march on two legs and hula dance. He married into an animal-training family as well. His father and his wife’s father were good friends. Jonny Rivers trained mostly domestic animals, while his wife’s family worked with exotics. Although he spent most of his life in California, about four years ago a developer let him name his own price for his 10-acre property outside of Riverside. He had been to the Texas Hill Country before and - like a lot of new arrivals - was drawn to its beauty. He was looking for a place with a house, corrals and pens for his animal menagerie and the then Lightning Ranch fit the bill. Along with a herd of gorgeous horses, Rivers also houses camels, ostriches, a water buffalo and oryx antelope. That’s in addition to the “aqua mules” - mules that dive from a 24-foot tall platform into a 6-foot deep diving tank. A wall in the ranch kitchen is covered with pictures of Rivers’ family with various and sundry animals and many movie stars of the past, like Arthur Godfrey. The newer ones show Bill Rivers with Ronald Reagan, Bill Cosby, Candice Bergen and LeAnn Rimes, among other celebrities. Rivers’ work takes him all over the world - three trips to Africa and three to Australia, but he especially enjoyed the last trip to Morocco. Rivers has worked with the same company out of California, Birds and Animals, for many years. The Lightning Ranch offers cabin rentals and trail rides. Every Friday night throughout the summer, it features a rodeo series with bull riding, barrel races, team roping, mutton bustin’ - all the favorites. Bus tours come from San Antonio to take day rides, watch the rodeo shows and see the aqua mules. It’s worth the trip just to talk with Bill Rivers about all the places he’s been and things he’s done and seen. Bill Rivers and his critters are at the BR Lightning Ranch, off FM 1283, 1/2 mile west of Highway 16 in Pipe Creek. The offer daily horseback rides, call in advance, 830-535-4096 or visit the website at www.lightningranch.com.